ACLU: Know Your Rights Bustcard - To fight police abuse effectively you need to know your rights. There are some things you should do, some things you must do and some things you cannot do. If you are in the middle of a police encounter, you need a handy and quick reference to remind you what your rights and obligations are. Anti-Police Terror Project (APTP) - Dedicated to ending state-sanctioned murder and violence perpetuated against black, brown and poor people. Berkeley Copwatch - The original Copwatch group. Began in 1990 on Telegraph Avenue as an all-volunteer organization dedicated to monitoring police actions and non-violently asserting our rights. Since that time, many Copwatch-type organizations have sprung up across the nation, in various forms. Berkeley Copwatch is based on the idea that watching the police is a crucial first step in the process of organizing. Berkeley Copwatch does not attempt to interfere in police activity or to resist police misconduct physically. Bay Area PoliceWatch - Allows anyone to call for information about their rights or to report police abuse. Hotline counselors document reported abuse and tell the caller how to get a rogue officer disciplined, demoted or fired; as well as the steps to take in preparation for a lawsuit. Callers with substantial damages and independent evidence are referred to cooperating attorneys. Licensed by the California State Bar Association to provide lawyer referrals. Campaign for Community Safety and Police Accountability (CCSPA) - Works to challenge the racism inherent in the city of Oakland's policing practices and fights to hold officers accountable to the community they serve by documenting and validating incidents of police misconduct and organizing community members to advocate for more responsive and accountable police practices. Campaign Zero - Seeks to prevent killings by police by limiting police interventions, improving community interactions, and ensuring accountability. Communities United Against Police Brutality - Overriding goal is to create a climate of resistance to abuse of authority by police organizations and to empower local people with a structure that can take on police brutality and bring it to an end. Cop Block - A decentralized project supported by a diverse group of individuals united by their shared goal of police accountability. CopWatchNYC - Helping New Yorkers document and expose unprofessional police behavior and hold police accountable. Counted, The - Database maintained by The Guardian newspaper on number and demographics of people killed by police in the United States. Fighting Police Abuse - American Civil Liberties Union (ACLU) manual. Human Rights Watch: Police Brutality - Police abuses worldwide are covered in various HRW reports. Innocent Down - Documents victims of police violence. Killed By Police - Corporate news reports of people killed by nonmilitary law enforcement officers, whether in the line of duty or not, and regardless of reason or method. Inclusion implies neither wrongdoing nor justification on the part of the person killed or the officer involved. Mapping Police Violence - Bearing witness to the black men and women killed at the hands of law enforcement in 2014. National Police Misconduct Reporting Project - Gathers reports of credible allegations of police misconduct so policymakers (and others) can make informed assessments of the nature and circumstances of police misconduct, and consider proposals that can minimize wrongdoing. A Cato Institute project. NYPD Confidential - An inside look at the New York Police Department. Mainatined by Leonard Levitt. NYPD Inspector General - Charged with investigating, reviewing, studying, auditing and making recommendations relating to the operations, policies, programs and practices of the New York City Police Department. Operation Herne Report - A report into police spying operations in Britain that concedes at least 42 identities were stolen by the secretive Special Demonstrations Squad (SDS) and its successor organisation, the National Public Order Intelligence Unit (NPIOU), between 1968 and 2008. According to this interim Operation Herne report written by Derbyshire Chief Constable Mick Creedon, the practice was used to infiltrate political and campaigning organisations. Creedon admits that over the SDS/NPIOU period of operation, 106 identities were either stolen or concocted entirely. Operation Herne was launched in 2011 following a succession of revelations that police spies had sexual relations with people in their target organisations and had fathered children. It was also alleged that police gave evidence in court under their false names. To date the investigation has amassed 6,000 paper and 50,000 electronic records. Creedon's report runs to a mere 23 pages. Also see WSWS article by Steve James. Police Complaint Center - A national non-profit organization that provides assistance to victims of police misconduct. Using available technology, the Police Complaint Center documents and investigates alleged incidents of police abuse. 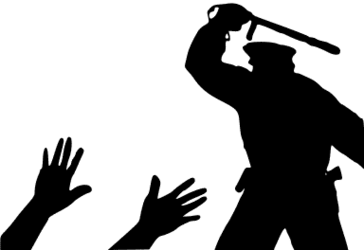 Stop Police Brutality - Reporting on police violence. The Counted - People killed by police in the United States. Maintained by The Guardian (UK). Washington Post: Police Shootings - WaPo is tracking people shot and killed by police across the U.S. along with brief information on names, dates, locations, and circumstances of each case. We Charge Genocide - A grassroots, inter-generational effort to center the voices and experiences of the young people most targeted by police violence in Chicago. This webpage last updated on Monday, April 17, 2017 9:28 AM.